Colds are potentially more dangerous than most people realize. That’s because they often weaken an already compromised immune system, making the sufferer more vulnerable to the flu and pneumonia. A nutritional deficiency is the most common cause of depressed immunity, but even people who make a point to eat a well-balanced diet often fall short when it comes to getting enough key nutrients. 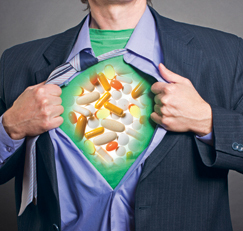 For this reason, many Americans turn to dietary supplements for extra protection. For answers, Bottom Line/Health spoke to Michael T. Murray, ND, a leading naturopathic physician who has spent more than 30 years compiling a database of more than 60,000 scientific articles on the effectiveness of natural medicines, including supplements. Mixed antioxidants. When it comes to fortifying your body to fight off colds, it’s wise to start with a high-potency multisupplement. I recommend one that combines zinc, selenium, beta-carotene (or other carotenes) and vitamins C and E. This antioxidant mix helps prevent oxidative damage to the thymus gland—a robust thymus is needed to produce T lymphocytes, a type of white blood cell that recognizes and attacks viruses and other infectious agents. Typical daily dose: 20 mg to 30 mg zinc…200 micrograms (mcg) selenium…25,000 international units (IU) beta-carotene…500 mg vitamin C…and 200 IU vitamin E. You’ll find roughly these amounts in any high-potency multisupplement. Many people take a multi-supplement year-round. Astragalus. Few Americans know about this herb, although it’s a standard treatment in Traditional Chinese Medicine (TCM). It is getting more attention these days because scientists have learned that it contains polysaccharide fraction F3 and other substances that stimulate different parts of the immune system. Test-tube and animal studies have found that astragalus has potent antiviral effects—important for preventing colds and the flu. In one study, 115 patients who took the herb for eight weeks showed significant improvement in their counts of infection-fighting white blood cells. Typical daily dose: 100 mg to 150 mg of powdered extract combined with any liquid, three times daily, whenever you have a cold or the flu or throughout the winter months if your immunity is low (for example, due to extra stress). Caution: If you have rheumatoid arthritis or some other autoimmune disease, use astragalus only under a doctor’s supervision—the increase in immune activity could worsen your autoimmune symptoms. South African geranium. Also known as umckaloabo, this herbal remedy is commonly used for bronchitis, an upper-respiratory infection that often follows colds, particularly in winter. In a study of 205 patients with bronchitis, those taking it had reduced bronchitis-related symptoms, such as a cough and shortness of breath. Other studies have shown similar effects. Although doctors who specialize in herbal medicine typically recommend this supplement for patients who have been diagnosed with bronchitis or sinusitis, I advise taking it if you have a cold because it reduces symptoms and helps prevent a secondary bronchial infection. Typical daily dose: 20 mg, three times daily, until the symptoms subside. Beta-glucan. This class of compounds is found in baker’s yeast, medicinal mushrooms (such as maitake) and a variety of grains. Supplemental forms have been shown to stimulate the activity of immune cells. They also stimulate immune signaling proteins, which help the body fight viral infections. In a study of 54 firefighters (who are susceptible to colds because of frequent exposure to smoke and other fumes), those who took a beta-glucan supplement had 23% fewer upper-respiratory infections compared with those who took a placebo. Typical daily dose: 250 mg to 500 mg daily. This dose is effective for treatment of viral infections as well as prevention (for example, when you feel a cold coming on). I recommend Wellmune WGP (it contains a substance derived from yeast that has been shown to strengthen immune cells) or Maitake Gold beta-glucan supplements—the research is more solid with these than with other products. Echinacea. This herb has been the subject of more than 900 studies. A few years ago, researchers reported that it was not effective for colds—probably because these scientists were using products that had insufficient amounts of active compounds. In my experience, echinacea is very effective both for prevention and treatment. Example: One study, involving 120 patients who had just started to experience cold symptoms, found that only 40% of those taking echinacea went on to develop a full-fledged cold compared with 60% of those not taking the herb. When patients in the echinacea group did get sick, their symptoms started to improve after four days versus eight days in those taking placebos. Typical daily dose: One-half to one teaspoon of liquid extract, which can be added to a glass of water or taken straight, three times daily, when you have a cold or feel one coming on. Buy a product that is made from the fresh aerial portion of the plant. This information will be printed on the label. You will receive a higher concentration of active compounds. People who have allergies to plants in the daisy family (which includes ragweed) should not take echinacea. It’s important to remember that virtually everyone is more likely to get sick during times of stress. Reasons: Stress increases blood levels of adrenal hormones, which suppress the immune system. In addition, stress triggers the release of cytokines and other substances that decrease the activity of white blood cells and inhibit the formation of new ones. What to do: In addition to getting regular exercise and sleeping at least seven hours a night, make a habit of doing activities that improve your mood. Deep breathing, meditation or simply having a good time with friends will all help you stay healthier. If you want to stay healthy, cut way back on sugar. This is important because the simple sugars in sweets and sweet beverages (including fruit juices) diminish the ability of lymphocytes to fight off viruses. When you consume sugar, the immune system weakens within just 30 minutes—and it remains in a depressed state for more than five hours. It’s not clear why sugar has such serious effects on immunity. It’s possible that elevated blood sugar prevents vitamin C from attaching to and entering white blood cells, which makes the immune system less effective. My advice: Have no more (and preferably less) than 15 g to 20 g of sugar in any three-hour period. Sugar-content information is, of course, found on food labels. A four-ounce glass of fruit juice, for example, will have about 12 g of sugar. *Consult your doctor before trying these supplements—especially if you have a chronic medical condition and/or take medication. Some of these remedies may interact with medication. Most supplements need to be taken for at least six weeks to reach their full effect. Yuck! We Are Drowning in Germs. Know Where They Are Hiding.